'Hariharapura' is a sleepy village situated in K R Pete taluk, Mandya district. Hariharapura is an erstwhile town of Hoysala during the reign of Vishnuvardhan (11 th century AD). The entire village had to be shifted to the current location due to Hemavathi back water project. There are two temples in the village built during the Hoysala period. We visited Varahanatha Kallahalli, another village with a Hoysala temple dedicated to Varaha, Lord Vishnu's third avatar (form of Boar). But the temple has been pulled down for a complete makeover and a temporary shelter was made for the Lord. It may take about 2 more years for completion. The sculpture is supposed to be incredible and huge. But one can still enjoy the back waters of Kannambadi very close by to the temple. Hereon, we moved towards our destination of Hosaholalu. While we were driving towards Hariharapura ,we found a ruined temple of which we wanted to have a look. The temple was in complete ruins, There was no maintenance whatsoever. But there was a recently built temple for Basava (Nandi) close by this ruined temple. We found an interesting herostone lying near by. We could not gather any more information about the temple. Finally we reached Hariharapura and drove towards the priest's house. The priest was more than willing to guide us about the temple. The temple is dedicated to Lord Harihareshwara. The Lord Harihara is a combination of Lord Shiva and Lord Vishnu. The temple has undergone continuous renovation under various kings. There are two compartments in the temple dedicated to Lord Harihara and Lord Eshwara. The sculptures are intricately carved and the Shiva Linga has the image of Lord Ganesha's trunk which has to be observed keenly. From here, the priest took us to another temple dedicated to Chennakeshava.The Lord Chennakeshava is the family god of the Hoysalas. This temple is also in a ruined state with absolutely no maintenance. The idol of the temple has been shifted to another location and a new temple has been constructed. The interior is quite a Hoysala masterpiece. This place requires serious attention and maintenance. While visiting, this place can be clubbed with Hosaholalu . The Temple priest lives in the same village and is quite friendly and helpful. Directions from Bangalore: Bangalore - SH1 7- B R Koppala - Right turn - Pandavapura - K.R Pete - Left turn - Travel about 8 kms - Hariharapura. Places to visit around : K R Pete, Pandavapura, Tonnur Kere, Melukote, Nagamangala, Hosaholalu, Kikkeri, Govindanahalli and many more. Another fascinating post and superb captures! Thank you so much for sharing the history! It's been wonderful learning so much about your country through your blog each week! Looking forward to the next post! Have a wonderful weekend! The Harihareswara temple is set amidst beautiful backdrop. As Arti said, the temple indeed resemble an army bunker. Beautiful post TGS..! THANK YOU FOR REVEALING ANOTHER GEM!! That sunken temple looks awesome. Thanks for sharing. OMG!!! The first temple ruins is great!!! 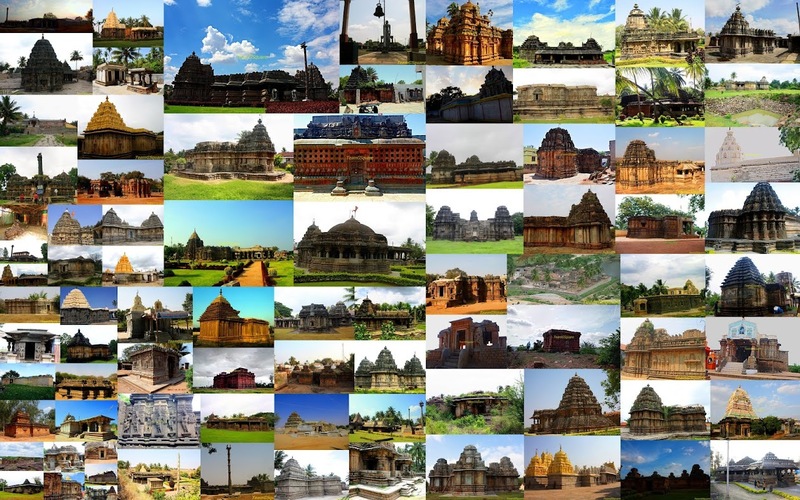 fantastic work, bringing to light such neglected and forgotten temples... there is so much to appreciate and preserve rather than simply build new ones! can u also post about the ADISHANKARACHARYA SHARADA LAKSHMINARASIMHA PEETAM at Hariharapura...? it seems to be an ancient Mutt..